We offer high quality EPS Ceiling Tiles at market leading prices. Offered range is highly durable and carries strong resistance to pressure conditions. They are completely waterproof, and can be washed over and over again. They are very decorative and can be used in kitchens, clean rooms, bottling plants, etc. 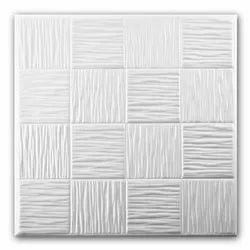 Our clients can avail these tiles in different shapes, sizes and colors. Before offering these in the market, we test these on several parameters to determine whether they conform to the desired quality standards. Looking for EPS Ceiling Tiles ?